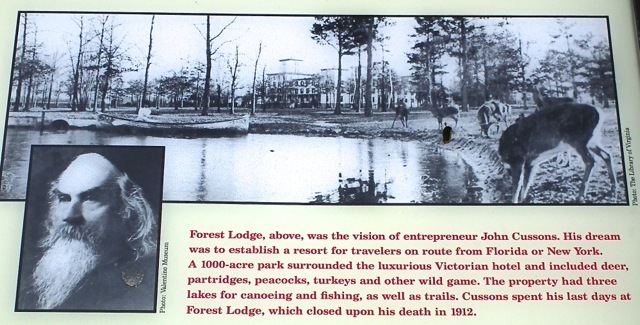 Forest Lodge was the dream of Captain John Cussons, an Englishman, entrepreneur, author, and confederate scout. He settled in the Richmond area known as Glen Allen after the Civil War, establishing a printing business. In 1881, he embarked on building a 6-story resort hotel on 1000 acres with lakes, gardens, boathouses, woodlands and even an amphitheater. The hotel had 100 elaborately decorated rooms and was near the railroad tracts since he hoped it would attract people traveling through by train. Sadly, it wasn't a great success and after his death in 1912 it was sporadically used as a boarding house, office space and apartments until it was demolished in 1989 for development plans. The Henrico County archives contain a video of the demolition provided by Mr. Wayne Mallory. It includes the total demolition of Forest Lodge including the removal of the cupola onto a flat bed truck. This cupola and some columns are now at a site not far from where the original hotel stood. The County of Henrico preserved this cupola and it now stands on the corner of Mountain Road and Old Washington Highway. The most moving part of this film is at the end where Mr. Mallory shows in sad silence the pile of rubble that once a grand hotel and the pride of Glen Allen, Virginia. The County is now using this information to build a miniature replica of Forest Lodge.